We have lots of great entertainment this year, both on the main stage and around the festival. Listen to live music, watch belly dancing, hooping and medieval arms demonstrations. We are very excited about the huge variety of acts and performances planned for the event. Greybeard and Dawn will be performing first thing on Saturday and Sunday morning, opening the festival with the warm tones of the Native American Flute. A craftsman and hobbyist, Ed lives in central North Carolina with his beautiful soul friend, Dawn. Together, they can be found frequenting local flute circles, music festivals hither and yon, and generally making happy mischief! 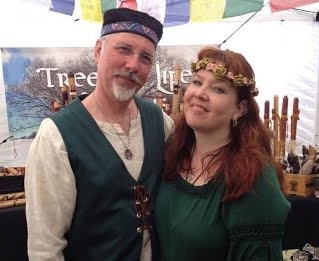 Be sure to visit him at Tree of Life Designs booth, where they will have not just handcrafted flutes from wood and bamboo, but also hand carved walking sticks, wood spirits, rhythm shakers and rattles, hand turned pendulums, magic wands and more. Based in Cary, NC, The Blibbering Humdingers are a husband/wife duo that play a mix of Neo-retro existential wizard nerd pop with a dash of do-wop, a sprinkle of steampunk and nibble of new wave. A "sound" you ask? Genre? Pishaw! We don't have a sound other than laughter and the sound of magic and the sound of one hand clapping because your other arm has been gnawed off by piranhas. If you're wondering where we got our band name from, then re-read the final chapter (not the epilogue) of Deathly Hallows. Luna pulls a clever "hey is that Elvis?!" to give Harry a chance to slip away. Besides wiz-rock - we also dabble in Steampunk, Dr. Who, Firefly, D&D, general filk, celtic folk, SCA, medieval, renaissance, Star Wars, Star Trek, and other geekness. Based in Raleigh, NC, Afrit Temple is an electronic music project created by Andrew Shakinovsky with the aim of fusing danceable beats with Middle Eastern stylings. Andrew is also a founding member of a Raleigh based Middle Eastern band called The Lost Nomads. He enjoys playing live music for belly dancers as well as experimenting with sounds from electronic gear and equipment. He has now teamed up with his wife, Amara of Electric Shimmy Bellydance and together they will bring you a new collaboration of music and dance performance focusing on Medieval and Renaissance stylings. Spiral Rhythm is a group of friends that have been singing together for almost two decades. They began singing at bonfires, gatherings, and festivals. Over time they have developed a unique sound complete with deep, multi-textured chants and explosive drums. Spiral Rhythm has evolved and changed, but their goal has always been the same-to raise the spirit through voice and song. Andrew Kasab is an American guitarist, harp guitarist and singer-songwriter. He is known for combining traditional and contemporary techniques, energetic performances, arrangements of modern works for the guitar and harp guitar and occasionally plays harmonica and ukulele too. Lirima is a belly dancer of 14 years with training in American Tribal Style, ITS, and Classical Egyptian belly dance. She is a belly dance teacher and is a contributing member of local dance troupes. This is her seventh year dancing at Pagan Pride Raleigh. Madame Tik-Tok is known for her sensational love for the cold blooded and the ability to charm her slithering creatures as she mesmerizes the audience with the combination of tribal fusion dance movements while flowing with multiple serpents as one entity.